I bought the extractor and bullet yesterday and had Kent's friend install it for me in Puchong. The products were great and the service at the exhaust shop was fast and the workmanship was good! I didn't change anything else except for the extractor and the center bullet and already can feel a difference! The sound on low revs has been slightly more garang! Hahaha! I recommend it to all other potential buyers as well. You won't be disappointed with the products that Kent has to offer. dun forgot my ZENDEN sticker ok? hello kent,how much for wira 1.3 sent to my house?last time i buy with u zenden bullet and install with ur friend shop at kepong..hehe,very improve fc only rm30 per week and use everyday to work.pls pm me for the shortshifter.good bisnes friend! credits for this good seller...got my mugen visors from bro kent last night....great quality and solid....free bump for you bro..
just a feedback... excellent service provided ... 2 tumb for him...just bought 1 cam and 1 crank pulley from him... best price given.... looking forward for his highcam in future.... keep it up kent... and may ure business grow !!! TO ALL forumers..., kent20 was a really good n nice person laaa. ive bought a myvi lightweight crankpulley. good prfmance part. best drive at 2nd n 3rd gear. and now im looking for emanage for my levin. also got a good suggestion n price from him. he told me the pro n kon for the parts. so sorry for my poor comments arr? coz im seldom on9 n seldom posting a comments. anyway thq dude!!! and thanx for the nice price and installation done to my car...will get bek 2 u shortly for ur zenden bullet...need 2 save up money 1st..
this item is a must have for every car.. i just install it for my wira.. even my mech in teluk intan reccpmend this product.. hehehe he keep asking me "mana ko beli?" n he want to order too cos if buy at other place the price is RM380 for wira(with bro kent just 300).. he said redlline is the best.. dont buy other product cos "cepat pecah".. u have to standy ur old pulley in ur car.. (tat's wat he said.. so bro.. i guess i need to 'tambah my order la.. Thanks bro. The filter's performance is pretty good, compared to an open pod without a heatshield I actually gained some pickup after driving for some time in hot weather. Good quality also hehe. Next time when got TT Ill call you la. Thanks for the fast service and delivery. Changed over to the Zenden replacement filter and I see that my MYVI's FC has gone down. Great product and at a good price too... will recommend to my other friends!!!! Thanks again. also nice car you have man.and nice person. just install the air filter to my car today at sunway..this bro kent are really nice person..totally satisfied with the pickup of my car..easy to rev and easy to reach higher speed...my car always semput when naik bukit n now not anymore..
thanks man fr the product and also ur advised about my 4 points stb bar. this guy name kent is very nice fella, care to share his knowledge about modification. My comment on this product... thumbs up, i can feel my wira more lighter than before, rpm goes up more faster, its worth for my money. For u kent, im sory coz forgot to tell u the way to LDP from my office. Your zenden stb bar is on my future plan. thanks kent.good price for quality.recommended.thumbs up man. I'm now monitoring my car's FC whether the FC increase or decrease.. Logically, it should reduce right ??? Anyway, I will update you later....okay.. I just got one off kent yesterday and i am satisfied with the product. throttle does feel abit lighter than before and its hell much better than my ye olde paper crap filter. hey thats my car !! hehe,the filter fits perfectly like a glove..
eh sorry for the late review.. got the filter last week.. tested for a week.. driving a 1.5(M) wira.. modded exhaust system d.. wat i feel is..
b) Smoother uphill drive.. and better pick up..
tat's all i get from 1 week experience.. got more will bump more.. sorry kent for the late review.. don't angry me k.. haha.. and Zenden always my choice.. hehe.. got so many zenden product in my car d.. haha Thumbs up for Kent.. SUPERB product manufacture locally. This is good stuff... apart from K&N. I can feel the higher REV. The filter so far so good. Improved pick up. The rpm rises very fast. Hehe. I will monitor the FC these few days. So far I can see some improvement. super thumbs up for bro kent,good product..really satisfied user here!! good seller.. eventhough he drive an altis, but very freindly with me who only got satria..
came all the way to menara matrade to send the item.. good stuff also, try it for about 300 metres.. just step a bit on gas pedal, my car gain more pickup than b4..
bro, will call u back if got money for extractor set..
Just installed my air filter ...very good service done by kent.cant wait till i drive out tonite.double thumbs up for u bro..cheers!! It cost me 285RM that I had to pay for just 1 bar, include money transfer fee, postage fee, custom tax fee, and not to mention another 21RM that Kent had to pay extra from his own pocket to the post office for some extra fee when he sent my bar, so thanks again Kent. So grand total amount was 306RM for the bar to get from Malaysia to Indonesia. It's like I bought for 2 bar and still get some change left right? hehe... So damn expensive if you were thinking about it, too expensive, but I really really want it so I guess it well worth it... and I got the bar safe & sound finally, installed it couple days ago, and it feels great!! Just 3 hours ago, kent install the zenden bar for me. I have the chance to test my avanza after installed with kent inside. Can feel the different immeditely! :D My avanza more stable when cornering now...best.....not goyang anymore. p/s: Thanks a million to kent for coming over in the rainy day. Keep up the good work man!!! After i install my Zenden Bar into my car i can feel a lot of difference !! When i take turn the car won't like flying or wanna terbalik..hahaha. It was unbelievable... Today i went to test drive about 80kh/h on roundabout..the car still can turn but got slide coz of de stuppid stone.. lucky slide bit bit. ANyway, im very very satisfy with my Zenden bar kent! Originally Posted by admin,Just got back from Cameron Highlands. Used the new Simpan Pulai highway up to the hill top. Very nice and wide road that is also good for testing out your car cornering performances. The drive up is also not so steep as compared to going up from the old Tapah road. We went up in 2 cars, yes, another Avanza of whom I am not supposed to mention here who! Hee hee hee ? While I used this new stretch, the other driver used the old road up the hill. Amazingly, I arrived at the resort about 30 minutes earlier! Excuses, excuses .. many cars it seems going up hill the old road way! Back to this new highway that I used, of cos?without doubts, I tested my baby new added Zenden Strut Bar doing around 120km on certain corners! And the result was amazing, really unbelievable but the whole car did not swing or bounce at sharp corners or at times when I had to almost immediately counter correct the steering hastily! The only time that had me worried was when my wheels went on the white divider lines and a screeching sound could be heard from it. But when I do fast in and out corners without hitting the white lines, there was no sound? My personal 2 sens conclusion is; DO NOT GO ON THE WHITE LINES ?not when you are going into sharp corners at a high speed as this lines are painted lines, smooth and do not give any grip to your wheels! My only worries now is having to wait a month or maybe 2 before I will know if I got any speeding summons! Hee hee hee ?call me mad, crazy or anything ?but it was worth the thrilling experience really! This Zenden Strut Bar works and thanks to kent20, it is worth every cent paid! BUMP for Kent. Installed today front two point strut bar. It was raining and his jeans half wet. pity him but overall nice guy! value for money :) Effect of the strut bar was immediately felt. BUMP again! Thanks for da super quick delivery!! Even all the way to the east coast, my strut bar just took 1 day to arrive after banking in da money. Even Pos Laju cannot beat that! You are super efficient, bro! 2 thumbs up! 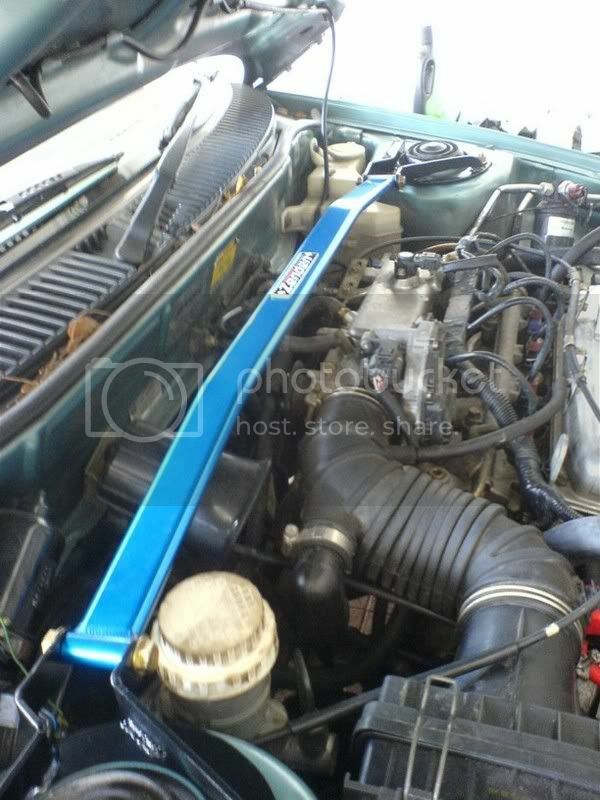 Nice strut bar..can`t wait to install it in my wife`s kenari. Very nice stuff.. A real bargain! Today just installed rear bar and replace front engine bar from him..
the car feel sharp at corner.. now turn in quicker n better.. i really no blow water la.. :_: anyway.. my car is honda civic sr4 with stock absorber. 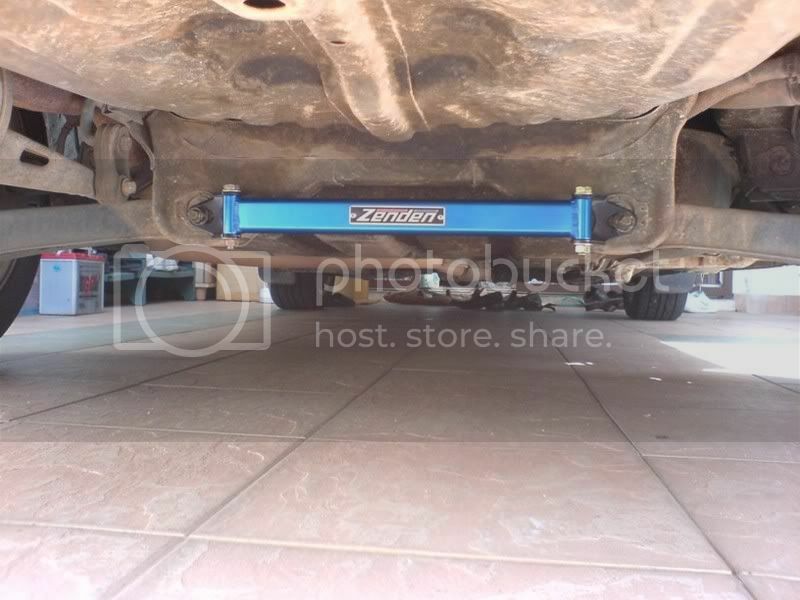 seller explained nicely to me abt Zenden bar quality and different compare to my own stock front engine bar. so for who is curious abt Zenden bar.. Dun worry. he will explain and compare for ur own one. Good job there, kent. seller also very friendly and nice. Keep it good work, kent. ps. hope u help me to find simota CAI that u said. two thumbs up for the seller and this thread. just bought rear strut bar.. nice cornering now..
nice ride bro. and congratulations again.. hehe. I installed Zenden Strut bars for the front and rear of my car and its superb!! guys, if you have 200 bucks to spend, I really recommend you get both! HI, bro. I'm the owner for waja in galaxy grey that purchased few items from you last week. Thanks for the delivery and installation service provided. The strut bar works very well and improved my cornering significantly. I'm interested to install rear strut bar as I believed it will further improved my cornering. Please advice whether it's necessary to install front side bar. Please pm me your best price together with few other items- wheel fender (right front), trunk spoiler (original design with galaxy grey colour), and 1 drum of Bardhal lubricant oil. Thanks. Bought washable air filter from bro kent, self installed, good pickup & fast engine respond after installation. Aiyah didn't realise you offer throttle body cleaning with air filter purchase laa bro!! kent,thanks to installed redline drop in filter and clean throttle body for my new saga blm at kuchai lama shell station today. Sean: What can i say? just change the center bullet for my brother's Vios. On the way back traffic jam and i really have to press break frequently coz it really improves the car pick up. car jerking reduced2 thumbs and 1 toe up coz right leg is tired.